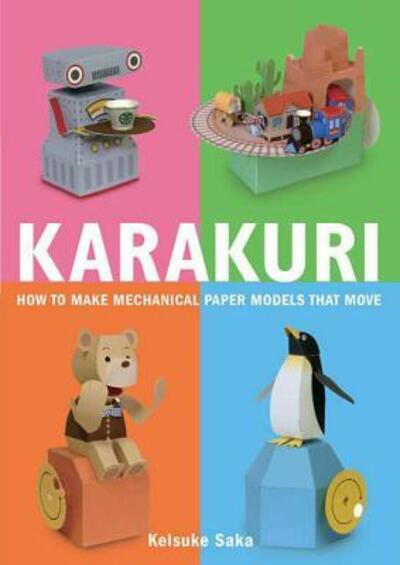 Originally published in, Japan, "Karakuri" is an introduction to the simple mechanisms, like gears, cranks, cams and levers, that are used to bring these amazing moving paper models or automata to life. There are ten pull-out printed cardstock pages so you can construct your own moving models of the different types of gears. These 'white' models can be used as a base for designing your own Karakuri or just admired on their own. The detailed explanations, accompanied by diagrams, explain the physics behind how they work and move, so you really learn about the properties of the different types of gears and cams. And to inspire you, also included are four fun full-color Karakuri models designed by the author, a well-known paper engineer. Also printed on pull-out cardstock pages and easily assembled, they include a clumsy tea-serving robot, an amusing penguin perched on an iceberg trying to fly, a delightful peek-a-boo-playing teddy bear and a mesmerizing train that goes around on a track and through a tunnel! With complete directions, 14 full-size models, and the science behind the craft this is a unique introduction to an ancient art. KEISUKE SAKA is a paper engineer and graphic designer based in Japan. He co-owns a design firm, has exhibited his paper models at a number of museums, and has published many automata kits.